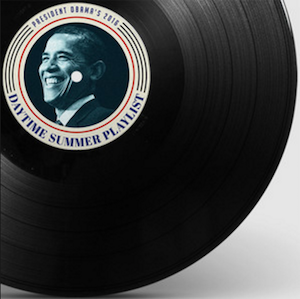 President Barack Obama has released his summer playlists on Spotify. In what has become a fascinating annual tradition, POTUS gives a sneak peek at what’s playing in his headphones. The Day and Night playlists both have a heavy leaning toward R&B, hip-hop, and jazz. The Day one includes contemporaries Janelle Monae, Leon Bridges, Wale, and Jidenna alongside classic greats Aretha Franklin, Nina Simone, and Charles Mingus. The Night list cools off the energy with artists like Ledisi, Chrisette Michele, D’Angelo, Billie Holiday, and Miles Davis. His 2015 lists included a bit more noteworthy genre variety, with Bob Dylan and Howlin’ Wolf alongside Justin Timberlake and Coldplay, but both years are a fascinating look at the music playing at the top. These playlists often spark questions of whether these are really Obama’s personal choices. Regardless, there’s little question that the Obamas have been one of the most musical families the White House has seen. Barack has multiple times slow-jammed the news with Jimmy Fallon, and Michelle sang along in James Corden’s carpool karaoke bit.